I was so happy when Grace agreed to try her hand at recreating her vision of these beads. Not only does she have innumerable years of experience creating unique and gorgeous lamp work beads, she exhibits an innate instinct for color, creative vision and perfection. I was immediately drawn to her willingness to listen, as well as the ease with which she interpreted exactly what I wanted. She then proceeded to create immediately, without fear or trepidation, the most beautiful beads. She is a very capable lamp work artist in every aspect of bead making. I shall not hesitate to call upon her services for all future endeavors, and I highly recommend her to any others who have come to expect excellence in custom lamp work beads. Thank you Grace, for a job well done! BRAVO!! I am now introducing a new "line" of my glass beads, creating pendants made using "Bead Hoppers." As a lampwork artist who absolutely hates making jewelry, I luckily discovered these wonderful components that make jewelry design easy! 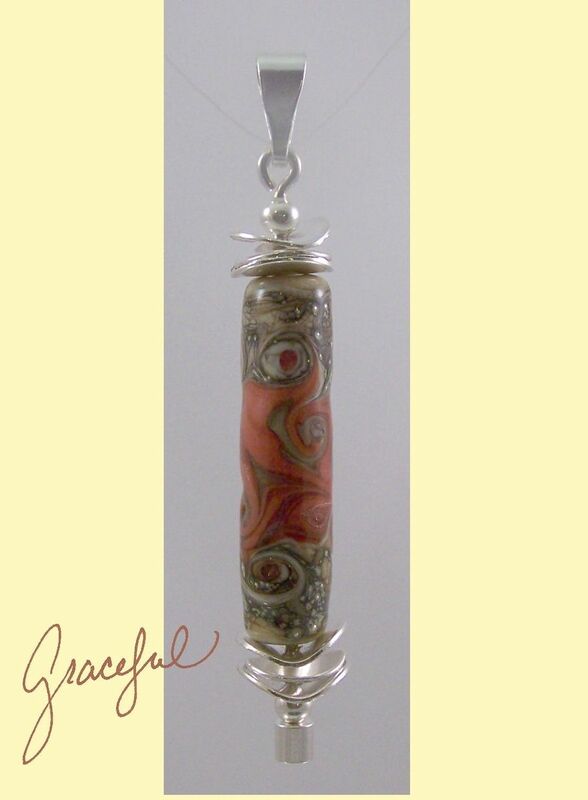 The glass bead featured in this pendant has a base of coral Italian glass, decorated with lines and swirls of Fire Lotus glass and silvered ivory. The end caps are ivory with swirls of more silvered ivory glass. The combination of silver and ivory create an interesting combination where you see the ivory outlined in black sometimes, and glittered every here and there with flecks of silver. I think ivory is beautiful with coral! 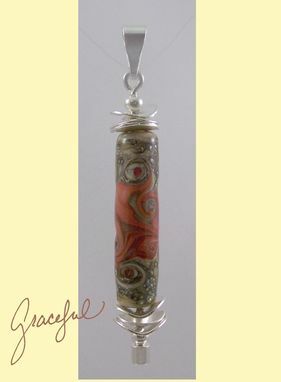 This pendant measures nearly 3 inches long and 1 inch at the beads' widest point. The beauty of "Bead Hoppers" is that they may be used with different beads. To disassemble, unscrew the bottom bead and the bead and components come off. Therefore, you might want to look at the single beads I have for sale to use with the Bead Hopper included in this sale! ♥I work with soft glass of many different brands and types. Generally I use a 3/32 sized mandrel unless otherwise noted. As a professional lampworker, my beads are kiln annealed over night for strength and durability. I personally inspect each bead for flaws and I thoroughly clean the bead holes with my trusty Dremel tool. ♥Bead sets are usually temporarily strung to inspire your creative juices! Any spacers or "Bead Hoppers" used are included in the sale. ♥All photographs are color balanced to represent the colors as accurately as possible; however different monitors do display colors differently. Photographs are sometimes larger than life to show detail. ♥If for any reason you are not be satisfied with your purchase I am more than willing to exchange or refund according to customer desires. Every maker has a story. Be a part of Graceful Bead Designs's story by placing an order, leaving a review, and seeing your review appear here.